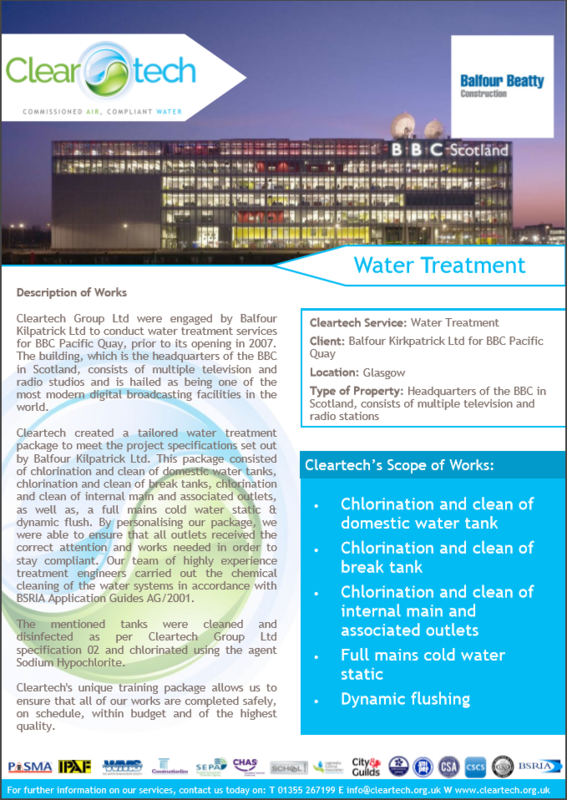 Cleartech Group Ltd were engaged by Balfour Kilpatrick Ltd to conduct water treatment services for BBC Pacific Quay, prior to its opening in 2007. The building, which is the headquarters of the BBC in Scotland, consists of multiple television and radio studios and is hailed as being one of the most modern digital broadcasting facilities in the world. Cleartech created a tailored water treatment package to meet the project specifications set out by Balfour Kilpatrick Ltd. This package consisted of chemical cleaning, flushing and chlorination of water systems. Our team of highly experience treatment engineers carried out the chemical cleaning of the water systems in accordance with BSRIA Application Guides AG/2001. Cleartech’s team of experienced water treatment engineers carried out the cleaning and chlorination of new installation hot and cold water services to BS5885 Specification. The domestic water tank and break tank were cleaned and disinfected as per Cleartech Group Ltd specification 02 and chlorinated using the agent Sodium Hypochlorite. Cleartech invest considerable time, effort and resources on building the expertise of our engineers’ and ensuring customer satisfaction. For further information or advice on water treatment, or for a quote, call today on 01355 267199, send an email to info@cleartech.org.uk or submit a contact form on our website. Click the graphic to view or download the BBC Pacific Quay case study.